Nap Time The camper who Joe the firefly visits looks very familiar. 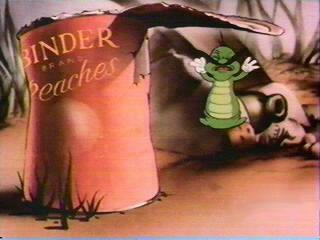 He is definately a caricature of director Chuck Jones! Binder Peaches Henry Binder is memorialized here on a can of peaches - "Binder Brand Peaches". A Better Tortoise Shell? 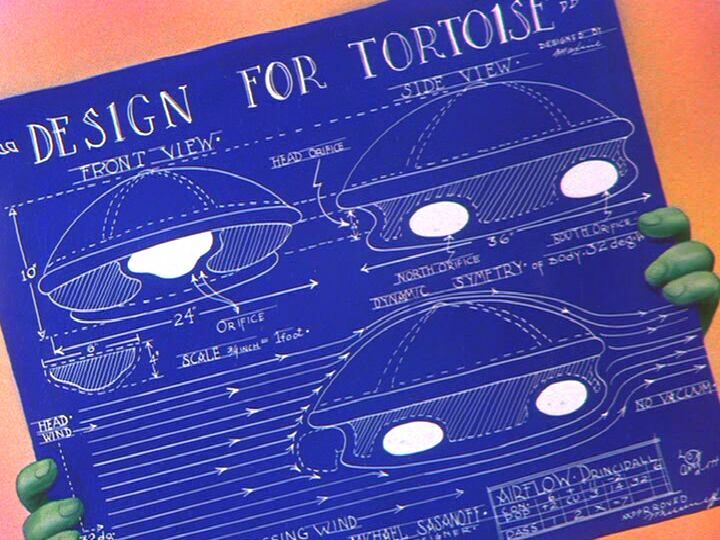 The new tortoise shell design has a few interesting notes on it. Near the bottom it has a airflow line labelled "passing wind". Under this is the name of the designer, Michael Sasanoff. This happens to be the name of a writer at the studio. 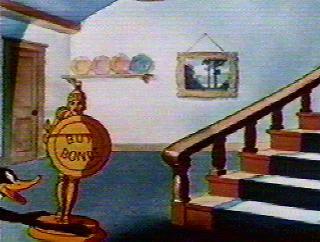 Shielded From View Daffy spins around a statue and for only a few frames you can see a message on the shield: "Buy Bonds". 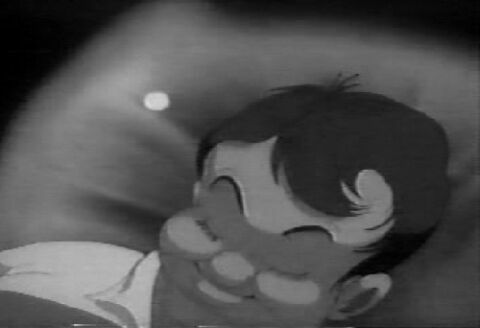 This cartoon was made during World War II - which was a time when the citizens were encouraged to buy war bonds. Friz sighting! 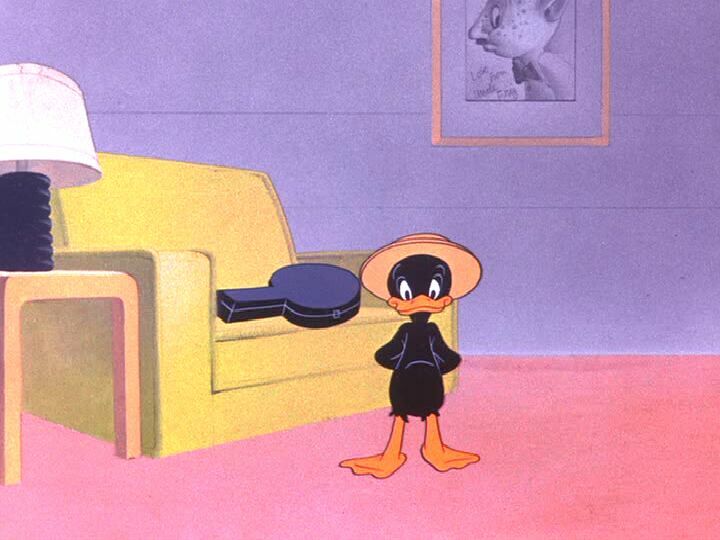 On the wall behind Sleepy Lagoon is a portrait of the director, Friz Freleng. If you look closely, it is signed "Love, from Uncle Friz". Mike and Tedd There are two castaways in this cartoon which are modelled on the writers, Michael Maltese (the short one) and Tedd Pierce (the taller one). They even provided the voices for the characters. Bunker artwork? 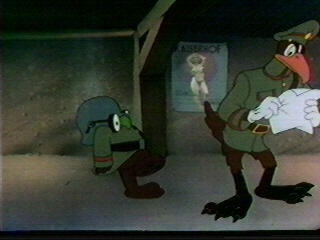 On the wall of the German bunker is a poster which was most likely not put there for children - but which would be on the minds of the average soldier. It has the title "Kaiserhof" over an image of a woman in her birthday suit.